The smartphones/communicators market (these are equal terms in this article) has been taking shape, but already now we understand, it is the future of PDA and cell phones market. The PDA market is getting thinner by losing in the competition with smartphones. It's a matter of time, when the PDA market will fade away. The companies traditionally engaged in producing handhelds do not want to miss the moment, and step by step they are looking for a new place under the sun (i.e. on the smartphone market). 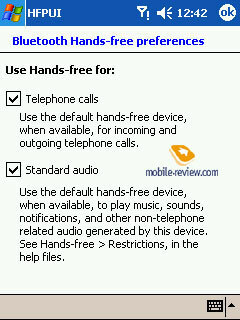 Some companies have already solved the problem and release their devices one after another - Nokia, Sony Ericsson, HTC. Palm (now palmOne). 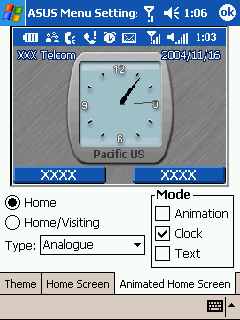 The first attempt with the keyboard communicator Palm Tungsten W, which turned to be a failure. 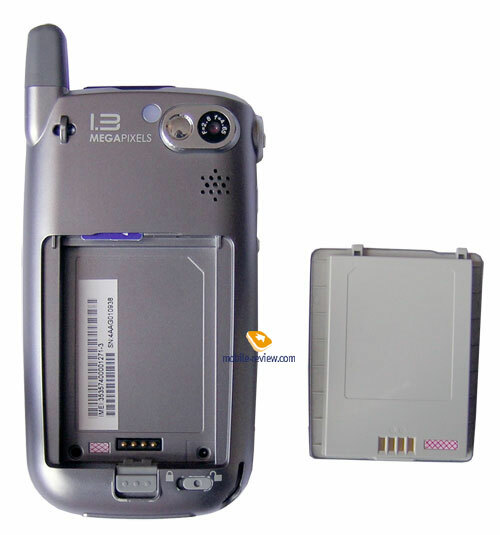 The company acquired Handspring and continued the release of successful Treo models. HP. The first timid attempt, which is almost forgotten, is HP Jornada 928. After the merge with Compaq, HP has been planning to release communicators. For a long time the company had been preparing the release of the HP iPaq 5600 series, but eventually it cancels the release. HP takes up WANDA reference design from Texas Instruments (TI) and works on HP iPaq h6000. After 2 years (!) following TI's announcement on the readiness of WANDA, HP releases its communicator. We see, the release has been thoroughly thought out. Samsung. There is a great variety of interesting models that are roaming from exhibition to exhibition. Many models are simply cancelled, nobody remembers them, and if a mass production takes place, by that time the models get outdated. Motorola. 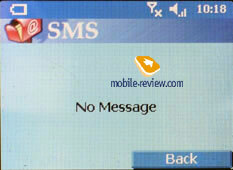 After the release of the successful Motorola MPx200 the black bar follows. The MPx100 has been cancelled, a failure-model MPx220, constant delays and unclear situation with the release of Motorola The MPx. We can recall such long-produced smartphones as Siemens SX1, BenQ P30, Neonode N1. In general, the smartphone market is the field for experiments for many companies. 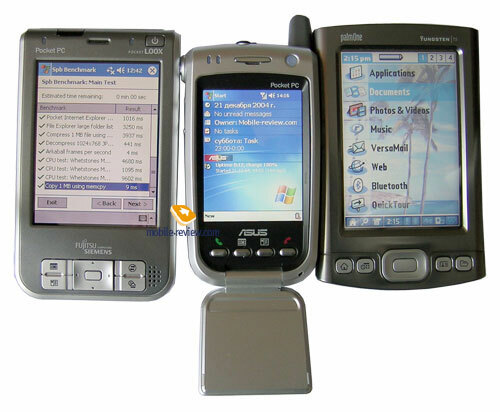 Among the largest PDA makers only Dell, Fujitsu Siemens and Asus currently have no smartphones in the model line. Dell announces its communicator in 2005 (it seems to be another hit on prices), Fujitsu Siemens doesn't need a smartphone in the model line, it's senseless to make competition with its German member of the concern (I mean smartphones produced by Siemens). And if we talk about Asus, this company is about to release its first smartphone - Asus p505, which also belongs to the team of the long-produced and long-awaited models. Well, let's draw the common trend before we start our review. All traditional PDA makers reserve their place on the smartphone market, as they understand the days of the PDA market are numbered. The same way follow traditional mobile phone makers. The newcomers have the tradition to cancel models or suspend the release. The competition will get tougher, and more interesting models will show up. 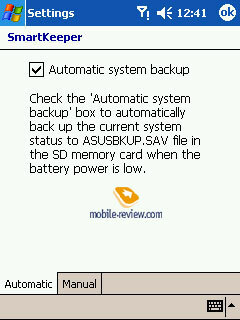 For a long time this model has been called Asus A8100, the first info on the device dates back to the late 2003. 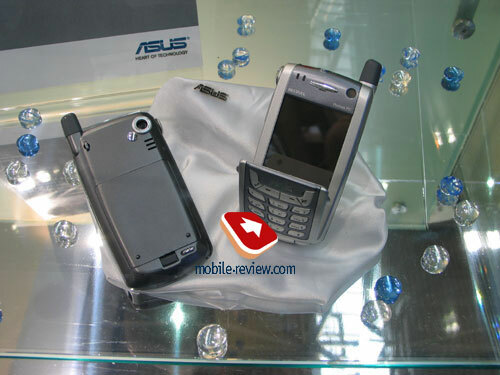 In 2004 the model appeared in a changed design and under the name of Asus p505. 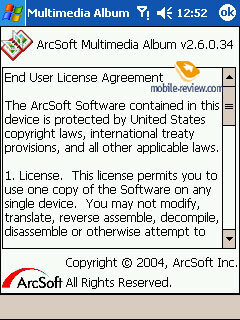 Now the model got certified by the US Federal Communications Commission (FCC), i.e. it should emerge in a month or two (maximum). 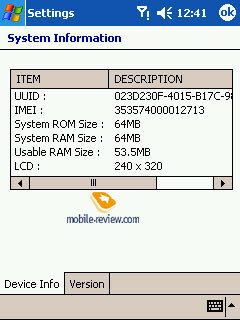 Well, what is Asus p505? 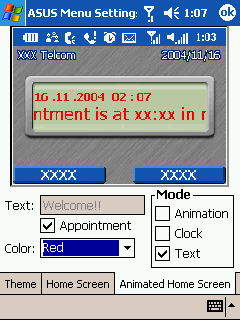 It's a tiny communicator equipped with a touch screen and a flipping digital keyboard and powered by Windows Mobile 2003 for Pocket PC Phone Edition. The closest rival is HTC Magician (the review is available here); the indirect rival is Sony Ericsson p900 (but not the p910, which is obviously better). If we sum up all the specs, the Asus model finds itself somewhere between them, but we cannot say that Asus p505 is strictly worse than Sony Ericsson p900 or better than HTC Magician. Each of them has its weak and strong points, pluses and minuses. The dimensions of the smartphone can't be considered the smallest among the analogs, Asus p505 is smaller than Sony Ericsson p900, but bigger than HTC Magician. The model is noticeably smaller than traditional PDAs. As for the appearance of Asus p505, it has a good and original design, you won't mix it up with something else. I wouldn't say that only strict or smooth lines dominate. One of our reprimands towards HTC Magician was its too simple design, that's not the case with Asus p505. 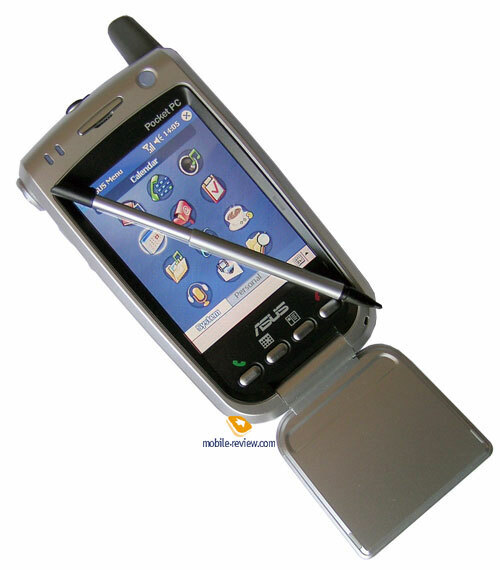 However it carries an external antenna - a definite remnant from the past (the only shortcoming with design), the external antenna proves the fact the device had been projected for a long time, when almost all Pocket PC had one. The shell is made of silver plastic, it doesn't feel metallic. It fits the hand mostly due to its rounded edges. The assembly quality is high, if you squeeze the device in your hand, it won't creak, the details fit each other. There is a small backlash in the battery module, you can feel it by pressing the digital keyboard. But it might be the problem with the trial sample we've got for our tests. The device weighs 170 g - it's heavier compared to similar ones. The dimensions and the weigh allow to carry it in a pocket of a jacket, pants, or at the belt. However it feels weighty in a T-shirt pocket. Let's speak about the work with the flip closed. The flip is neatly fixed when open or closed, it isn't loose. Nothing creaks. There is a shortcoming, you can't remove the flip if you need. When you press digital keys, the keys are pressed exactly and not the touch screen under them. Well, when you close the flip, you automatically launch an alternative user's interface (UI) specially designed for this particular model. 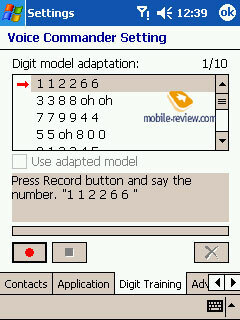 For the first time the manufacturer applied this approach (special interface written) with a Pocket PC model. 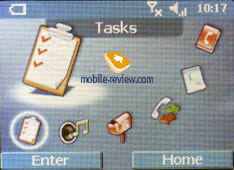 The fact facilitates the handling of Asus p505 as a phone, it allows to carry out basic functions. 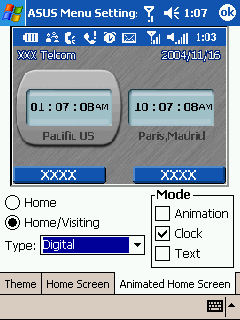 You can display either one or two clocks on the start up screen (analog and digital) or a text (any text or a current reminder) instead. Below the screen there are two buttons, which stand for soft keys. 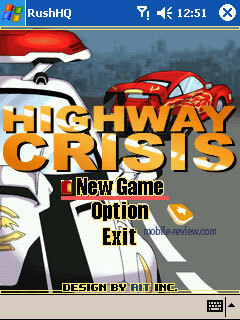 By pressing the left one you get to the main menu. You can navigate the menu with the help of Up/Down buttons on the digital keyboard or the joystick placed at the left side (read the detail about it below). Up/Down buttons are comfortable in use, but the functionality is excessive (the joystick alone would be enough). Unfortunately, when the flip is closed, you can only view info, as you can only enter numerals from the keyboard (there are no letter inscriptions). 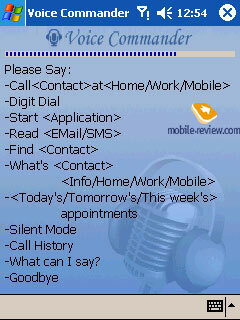 So you can't create a new contact, edit the reminder, reply to SMS. For this purpose you need to open the flip. It's a minus, however not a serious one. 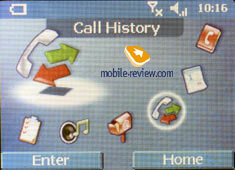 You can view contacts (dial numbers from there), a calendar and tasks, change a profile, view the calls log, read SMS, make voice recordings, operate the built-in camera, that's not little. 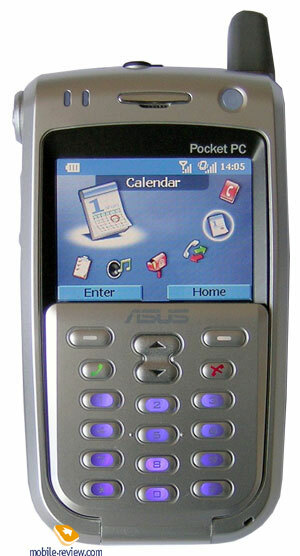 I'll remind you that an alternative UI for Pocket PC has appeared for the first time in Asus p505. May be it will be worked out, extended and have text input in further models, however its very existence is also a good thing. By the way, Asus p505 will be shipped also under the trademarks of mobile service providers, so interface design can slightly vary (in color and a icon position). The last thing to add, the keyboard backlight is excellent, in the dark there is no problem to make up all the numerals (on the other side, there shouldn't be any, as the letters are lacking). 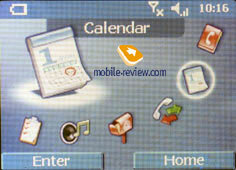 By opening the flip we automatically resume Pocket PC interface (to be more exact, Asus Menu, from here you can launch other applications or got to the standard start up screen). 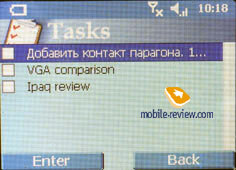 Gradually the screen with a 2.8" diagonal (transflective, 65K, 320x240 pixels) becomes a norm for Pocket PC communicators, a de-facto standard. Asus p505 is equipped with a screen comparable in size and quality with HTC Magician, it's better if we compare with Motorola MPx and Rover S2 (color rendering, viewing angles, the lowest backlight level). 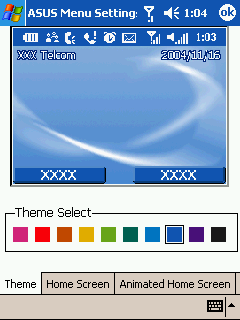 In general, this screen is the best in its class, however it yields to the senior Pocket PC models and Sony Ericsson p910 in size (no matter whether the flip is open or closed). Do remember, we have the shorter screen diagonal first of all due to smaller linear dimensions (the screen size directly depends on the front panel size). 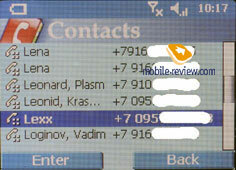 Below the screen there are 4 buttons: End, Send, Calendar, Contacts. The form and the location of the joystick make the smartphone little fit for arcade games, though you can get accustomed to it. Above the screen there is a loud speaker, two LED indicators and an on/off button (it blinks red when the battery is almost drained out). 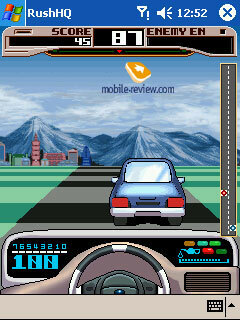 The 5D-joystick (an interesting peculiarity of the smartphone) is located at the left side. 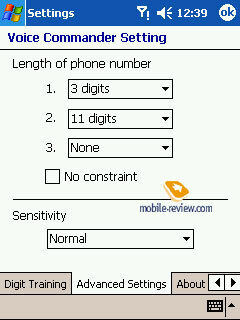 It works in two modes (adjust the mode in the settings). In the first mode it works as the joystick (four directions and one press). 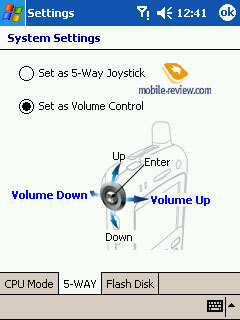 In the second mode Left and Right buttons stand for the volume control. Everybody who tried the joystick belongs to one of two camps - the first camp (includes the users of Sony Ericsson p900) considers it little comfortable, the second camp has the opposite opinion. There is just one advice - before buying the smartphone try the joystick yourselves and decide whether it is good for you, that's an individual thing. To my mind, it's the matter of getting accustomed to something new. Below the joystick you find a camera and voice recorder buttons. Let's speak about the camera. The CMOS matrix has a 1.3 megapixel resolution. The built-in flash as usual is almost useless in the dark, the effective light distance makes up 20-30 cm. 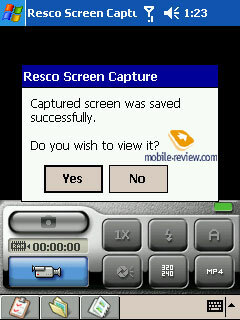 When you press the camera button, you automatically launch a camera application. The screen serves as a viewfinder. 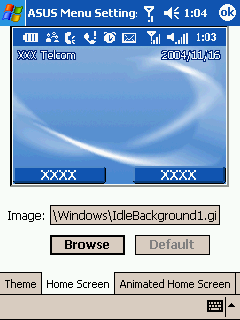 The picture displayed has a 240x180 pixels resolution. Single Shot. An ordinary shot. 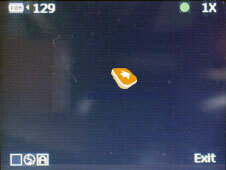 There are several variants of resolution from 80x60 to 1280x960 pixels; 4x zoom; shutter sound on/off (in all modes). MMS. A shot for multimedia messages. Resolution varies from 160x180 to 320x240 pixels. Burst. A series of shots, up to 10 frames running. Resolution: from 80x60 to 640x480 pixels. Composition. Composed shots in different frames. Resolution: from 160x120 to 1280x960 pixels. Video. ASF, MP4 and 3GP formats available. Resolution: 320x240 or 80x60 pixels. 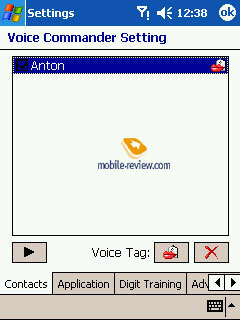 Caller ID. 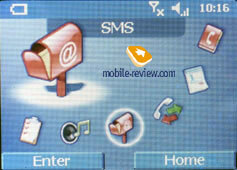 You can attach a photo to a contact, choose among the following resolutions: from 80x60 to 160x120 pixels. 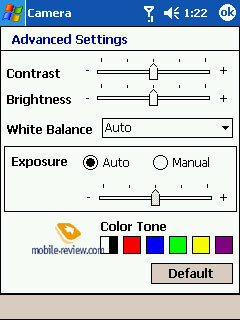 Other settings include: contrast, brightness, exposure, and white balance. 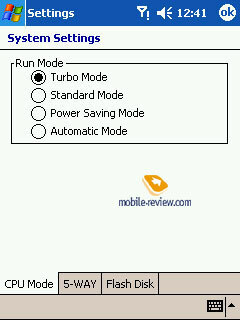 In all, these rich settings are inherited from Asus A730. The picture quality is average, it's worse than that of Motorola MPx, better than that of Motorola MPx220 and at the same level with HTC Magician. At the right side of Asus p505 you see a button, which enables voice commands (during communication via Bluetooth headset by pressing the button you launch voice commands). 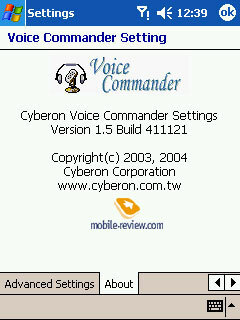 This program is notable for you shouldn't train it, just call commands and names from the address book with your own voice. We'd mark the high recognition quality, to say the truth I didn't expect it. 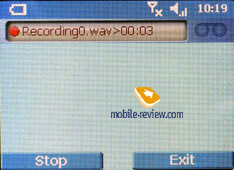 Should the recognition quality be not satisfactory enough, you can train the program adjusting it to your voice, just dictate voice marks (Motorola MPx has a similar system, but without a training capability). On the top end there is a SD/MMC slot, an infrared port and a 2.5 mm audio jack. The back panel hides a camera, a self-portrait mirror, a flash, a hole for the strap and a battery compartment. At the bottom you find a synchronization connector and a silo. Like in case with Asus A730 the silo is located at the bottom. It's original, but with the flip open it won't be comfortable to eject the stylus. There is a SIM lock under the battery compartment. It's original and quite unusual. You should insert it like an SD card by pushing it down. Eject the SIM card by pressing the part sticking out, the card will jump out. Easy and comfortable. The Li-Ion battery is capacious of 1000 mAh. The manufacturer claims 4 hours of talks and 15 hours in the PDA mode. Our tests revealed that the device wprked for 2 days of moderate use, 15 minutes talks per day (that's standard for such devices). In the reading mode (the lowest backlight, the lowest processor frequency rate, auto scrolling) Asus p505 was good for 13 hours. Under the maximum load the battery was drained out after 2 hours 30 minutes of continuous work. There is an extended battery (3000 mAh) optionally available for the users who need longer performance. 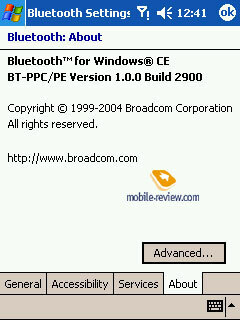 The Bluetooth version is 1.1. Asus installed WIDCOMM (now Broadcom) drivers, which became an industrial standard, that means the functionality of this wireless standard is the highest. 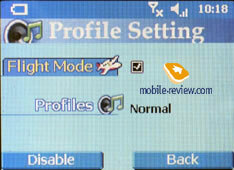 There are almost all known profiles preset. 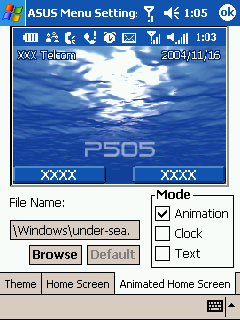 Thus Asus p505 has a definite advantage against HTC Magician, which involves drivers built in the OS. Asus p505 carries standard 64 MB of RAM onboard, 53.49 MB of which are available to the user. This is quite enough for normal operation. There are 18.4 MB of flash RAM available. It's not much, but don't treat it as a shortcoming, remember prices for flash-cards (including SD/MMC) are falling down. Asus p505 is powered by Intel PXA270 processor, however it's unclear what will be the maximum frequency rate. We tested the sample with 520 MHz, but eventually for sale will be offered a 416 MHz version. That doesn't matter, as you could speed up 416 MHz to 520 MHz, if you wish (the procedure runs safe, you could experience only the data loss and the hard reset). 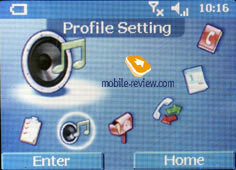 Asus p505 works under WM 2003 for Pocket PC Phone Edition, which is the very Windows Mobile 2003 for Pocket PC Second Edition (read about it in the respective review), but extended with several applications to manage phone functions. Backup. The program is designed to backup the data. It copes well with basic functions and lacks fine tunings. 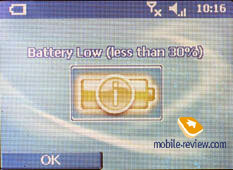 SmartKeeper allows automatic data backup when the battery charge level drops to the critical mark. 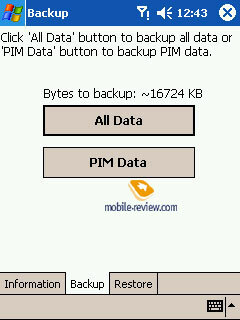 This application is an essential one in PDAs by Asus. Conference. The communication among several subscribers at a time. 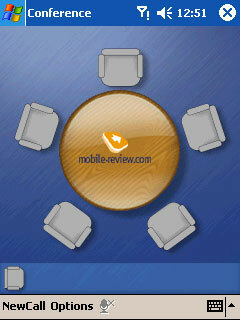 It's a visual kind of a round table (operator's support needed). 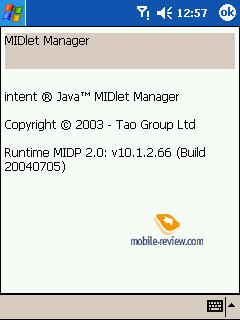 MIDlet Manager launches J2ME applications. Multimedia Album views files shot by the camera. Photo Contacts. 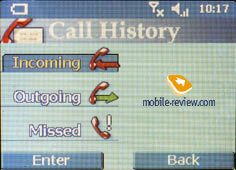 It allows to see the photo of the caller at the incoming call. 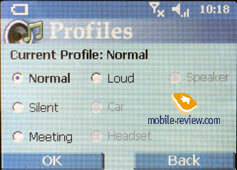 Asus Menu. We talked about this utility above. 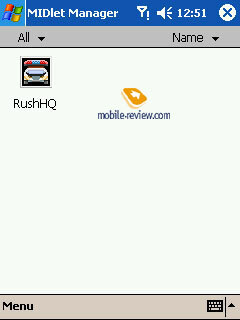 It's a simple shell to launch applications. It's a good debut by Asus on the smartphone market. 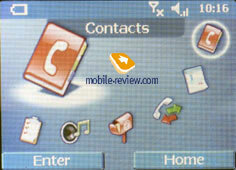 Asus p505 turned to be good as a phone, there were no problems with signal reception and voice communication. The vibro alert and the loudspeaker are average in power. Expect this device to appear in the market late in February at some $650 (this is our forecast, nobody has announced official figures, the model was said to be cheaper than Sony Ericsson smartphones). When it will show up, there will be just two rivals - Sony Ericsson p900 and multiple HTC Magician clones (I-mate JAM, Qtek s100 and so on). The comparison with Sony Ericsson p900. It's hard to compare devices based on different platforms. If we take into account nominal specs, the p900 is slightly behind (processor, memory, megapixel camera, extended battery). Sony Ericsson model has a better screen (it's larger in all modes), better design (there is no external antenna) and a removable flip keyboard. 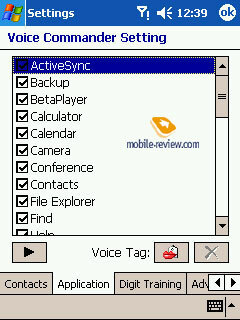 Windows Mobile operating system adds an advantage to Asus smartphone (great variety of software). I'd repeat, it's hard to compare devices based on different platforms, but in all, Sony Ericsson eventually wins. The comparison with HTC Magician. Both models are similar in features and dimensions. Asus model has the following pluses: design, digital keyboard, Bluetooth drivers, cradle, famous brand - Asus. HTC Magician features smaller dimensions, no external antenna, slightly better assembly quality, more capacious battery, it's already commercially available. Pluses are balanced, so we have a draw. In conclusion we'd say the year 2005 seems to be very interesting in the aspect of new smartphones. HTC will at last push out a very strong rival Sony Ericsson p910i, BenQ p50 will appear, Dell will announce its first communicator. HP and Asus will also announce new models. This is not the end of the list. Well, keep an eye on news and publications on our site..